It is me again, Molly. 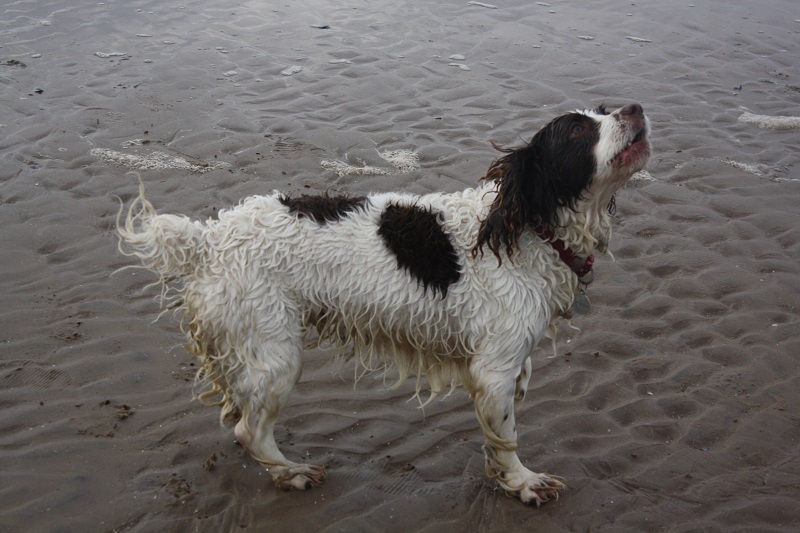 I have been staying with Uncle Darren and Aunty Susan again and I have borrowed Uncle Darren’s blog to tell you about the day they took me to the beach! Here we go again. I honestly do not know how Fuzzbutt worked out my WordPress password but we suspect she is brighter than the two of us combined so I am not really surprised. We carefully towelled her dry at the beach and stopped again at the supermarket where we bought her a tasty snack. Previous Unveiling the Super D logo! Thank you Eve😀. This is actually one of her favourite sleeping positions! My wife alleges I do the same. Uncle Darren says can he have a smooch too? Not sure what he means. Oh my last comment did not come out the way I wanted it to. I meant to say I was glad to hear I was not putting any stress on you. But I am sorry you feel everything else does. Anything I can do to help? Sounds like a day in doggie paradise (Jasper is jealous 🙂 I really smiled at the last photo, she looked completely exhausted from all the fun. Cute post! I am really looking forward to your guitar recital!!! Thank you. And we get her again next weekend! Have missed you. Glad you enjoyed the adventures of Molly! Happy new year my friend! Oh My Goodness is your little girl adorable!!! You two look like you both had such a wonderful time at the beach! She really loves the water!! Great sporting doggies!! Such a beautiful girl! She is our little buddy! We may have her to stay again in July but at least I get to visit her often. My wife has her all day at work as she belongs to her boss. Thank you for your lovely comment. I adore Molly!